Marketing has changed. In fact in the article “7 ways marketing has changed”, Ilana Rabinowitz breaks down how to adapt when making the switch to Social Media Marketing. If you are marketing using “traditional” marketing tactics, your business will not make the successful transition to Social Media Marketing. Why? Because, traditional tactics just don’t work on Social. The future of marketing was yesterday and your customers are expected to communicate in a whole new way; have you adapted? Good news is, we would like to help you make the switch! Joshua Hensley, the owner of Blue Fin Social Media, and I have partnered up to provide advanced Social Media training to Wichita business owners looking to make an effective transition. Our free class will explain the necessary steps to shift from traditional marketing to savvy social methods worthy of growing a modest following of fans who are eager to market for you. And yes, it’s possible! But we’ll discuss that more during the class. 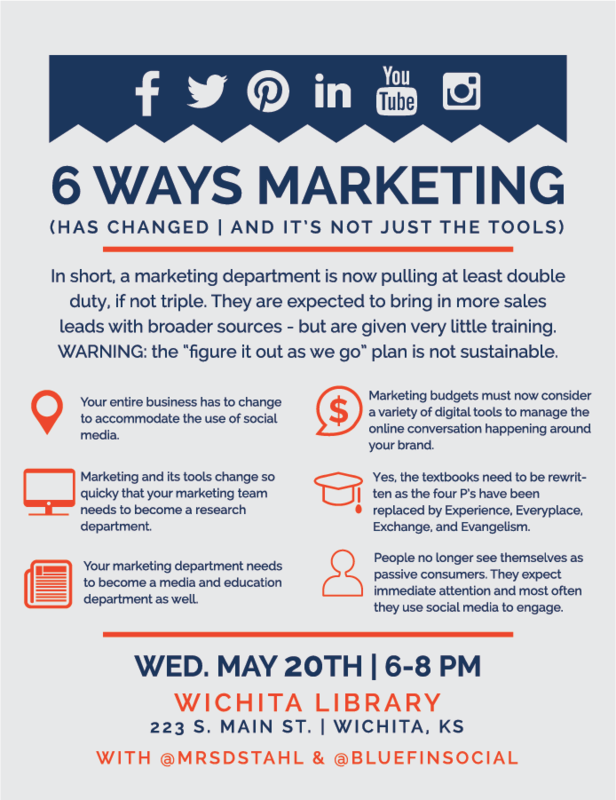 Join us Wednesday, May 20th from 6-8 at the @wichitalibrary for a Free #socialmediamarketing class with @mrsdstahl and @BlueFinSocial -Tweet it! We will conduct a real-time contest giving attendees a chance to win a one-on-one social media consult with both Joshua and I. We will personally review the winner’s current web marketing strategy and give custom instructions on how to improve marketing goals; during a scheduled appointment. Seminar attendees must tweet or post images representing seminar lessons learned using a specific hashtag #marketingmatters and tagging @mrsdstahl and @BlueFinSocial during the seminar. Attendees may use Twitter or Instagram to post using these requirements. At the end of the seminar, two winners will be selected; one with the most creative tweet and one with the most creative Instagram update. With only 30 available spots, please give us a heads up by saving your seat on our FACEBOOK EVENT page.